I drove to Swindon the other day. It’s good for the soul. I hope. It’s also good for catching up on audiobooks and podcasts. Anyway, sitting in slow-moving traffic on the way back, I found myself behind a van which had on its back doors a list of bullet-points setting out the services that the company offers. I forget the details; it was an engineering company doing things like ‘high-speed diamond cutting’. But one service did stand out. Oh, boy – I’ve no idea what that is, but I really want to do it! That’s not got much spam in it! Thankfully, in recent years, email spam filters have improved at almost the same rate as spammers. I’ve been getting relatively little junk, despite the fact that my mail system gets a very great deal. And I imagine most of us humans now have a pretty good built-in filter for the ones that slip past: messages which claim to be from ‘Kate Smith’ but have an email address of angie99@hotmail.com don’t stay in my inbox for very long, for example. The big effort by spammers these days has gone up one level – they’re less concerned about getting humans to follow links than they are about getting search engines to do so. Email spam doesn’t help much with your Google juice, and I gather, young reader, that the youth of today doesn’t use email much anyway? So ‘comment spam’, where people try to get a more connected web presence by posting comments on all sorts of blogs and forums which include embedded links to their site, is today’s weapon of choice. A common example arrived this morning – I wrote an article a while back about the Sony eBook reader and somebody tried to post a comment which seems banal enough: “Nice blog adding this to my twitter now”. The punctuation is somewhat sparse, but I can imagine many would be taken in by such a comment and allow it through – not noticing that the link associated with the name (which would appear on Status-Q), would take you to a commercial site. The rogues no longer try to put compelling advertising or even keywords in the message, they just try to make it inoffensive enough that site owners will allow it to be attached to pages with a relevant theme. It’s highly unlikely a user would click it, but search engines might well follow it and so form some conceptual link between eBooks and the originator’s accursed site. This morning’s one, though, was yet one step further removed from the spam of old. It was spam linking to a site about SEO – search engine optimisation. (This is about helping search engines find your site when people do relevant searches, in the same way that advertising is of course about helping people to find your product even when they don’t know they want it yet.) What’s more, this post wasn’t even about SEO, but about books about SEO! A comment, on someone else’s page, pretending to be about twitter, and in fact linking search engines to a page about books about how you can get people who are searching for eBooks to find your site… How many levels of indirection can you get? For some time, when I’ve posted something here, a notification has been put on my Twitter account, and since my Tweets also go to Facebook, it’s been visible there too. I realised recently that the final stage had stopped working: while my manual tweets get copied to Facebook, the remotely-posted updates weren’t doing it any more – some change in the FB Twitter app, I guess. So I’m now investigating Wordbooker, a WordPress plugin that will post directly from here to FB, and also claims to be able to synchronise some comments between the two systems – let’s see if it works! 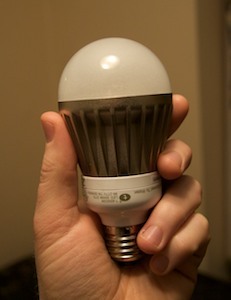 A package arrived today; a small but heavy one, containing my first LED lightbulbs. No, not the little ones that go in torches, but big ones designed to replace the 240v tungsten bulbs in my ceiling light fixtures. Michael had found a good UK supplier, and I wanted to experiment with what I’m sure will be the way we all light our homes five to ten years from now. As I’ve written before, I don’t really like the CFL (compact fluorescent lamp) bulbs that have been the only real low-energy option in the past. You know, the ones that look like some sort of lower intestine curled up where the bulb should be? Firstly, they’re a nasty colour, though much improved now. Secondly, they take a while to warm up to full brightness. Thirdly, they may use less power but they contain nasty chemicals which leads some people to question how environmentally friendly they are overall, and lastly, you can’t use them with dimmer switches, which rules them out for about half of the rooms in my house. Not just dimmers, either, some other electronic switches (like electronic timers) also don’t work. I’ve put a couple of these bulbs in, and I’ve sort of become used to them, but it’s really a case of how much I’m willing to sacrifice for my moral obligations, rather than something I do with joy. LED-based bulbs, on the other hand, use even less power, are probably more environmentally friendly to manufacture, supposedly last for somewhere between twenty and forty years, and are available in dimmable form. It was time to try them, so I ordered three different ones, even though they cost £25-£35 each. So, after a quick try, what’s the verdict? Well, the good news is that the brightness is really quite impressive. Anything over about 4W is a viable replacement for a 50-60W bulb, so, yes, they use about 10% of the power of a conventional bulb, and about half that of a CFL. These are also well-made, as they should be for that price. In five years’ time, when we’re buying cheap LED bulbs for a few quid, we’ll be amazed at the robust construction techniques used today. They hit full brightness immediately and the dimmable one worked nicely with my dimmers. All good so far. However, I’m not sure that any of them will find a permanent home in my light fixtures yet. Firstly, they’re too white. They don’t have the bluey-green tint of some CFLs, but they are still very white. This may be something I’ll get used to over time, but if you’re thinking of buying any, be aware that those labelled ‘warm white’ are still not nearly as warm as a tungsten bulb. They’re fine if you’re keen to simulate daylight in your sub-basement, but not if you’re after that cozy, welcome-you-home-on-a-cold-winter’s-night look. Particularly if you mix LEDs and traditional bulbs in the same room, you’ll notice the difference. Fortunately, manufacturers and suppliers are starting to publish the colour temperatures – don’t trust anything described as ‘warm’ if its temperature is over 2800K, and even 2800K leaves something to be desired. But that’s not the main issue. The main issue is that, while a glowing filament emits light in all directions, LEDs are very directional. They therefore make good spotlights, which is why LED bulbs have chiefly been sold with GU10 connectors, as used by the little spotlights that have been embedded in everyone’s ceilings in recent years. There, I can imagine they work well, and are worthwhile because, charming as those lights are, they’re not a very efficient way to light a room. When my existing GU10 bulbs give up the ghost, I’ll replace them with LEDs. But most of my house has light fixtures – some of them antique – which make it rather obvious if only the top half of the bulb is emitting light and most of that light goes in one direction. The very unexciting paper globe shade above me, which I’ve been planning to replace for about 7 years, if fitted with an LED, does a very good job of lighting the floor in the middle of my small study but leaves the periphery in shadow. The main glass fitting in the centre of the dining room has two bulbs, side by side, mounted horizontally. With LED bulbs, this lights up the walls but not, to any great degree, the table. It looks very strange. Until this is sorted, I’d need two or three times as many lights in every room to get reasonable coverage, which undoes some of the benefits. CFLs are better, but I can’t use those because of my dimmer switches. And the 7W bulb pictured above, which was intended to go in an Ikea R80 spotlight fitting at about eye-level on the kitchen wall, is a good, bright bulb but I can’t use it because it’s the wrong shape: the dome of the bulb extends beyond the lampshade and so is dazzling. Ironically, the one good spotlight-based experiment fails because the bulb sends light in directions I don’t want it to go! So, my advice is, if you’re willing to pay a lot, these bulbs are starting to become quite good. But unless you’re planning to use them as ceiling-recessed spots, you may need to budget for new light fittings as well. Still, look on the, ahem, bright side. At least the fittings may cost you less than your lightbulbs!